There is one conversation that comes around in the UK, as if by clockwork, day after day, in city after city, town after town. What are we going to do about the speeding cyclists on this path? How can we make cyclists behave responsibly on this path? What can be done about inconsiderate cyclists on this path? This tweet happens to be about Edinburgh (and its busy canal towpath), but it could be about paths or shared walking/cycling spaces in most other cities and towns in the UK – so I don’t want what follows to feel like it is particularly criticising Scotland’s capital. I could have chosen lots of other places to write about… It’s just that it was this tweet that I noticed. And I want to be clear that I’m offering no criticism of the person who asks this question – quite the contrary. So – here in the UK we have a growing number of people who cycle. But in general terms those with power over the street designs in our cities and towns find that what’s ‘normal’ is stuck in the 1950s (or thereabouts). So people are encouraged to cycle by numerous campaigns… and slowly but surely they are doing so. More and more people are cycling. And cities start to put money into designs/infrastructure to help with this. But almost always these designs are limited by a pre-condition… which is that they must not take away from the flow of motor vehicles. There are attempts to try to fit cycling into the space, and to make it more friendly for those on foot – and various designs have appeared to try to do this. If there’s one place in Edinburgh where this ought to be possible it is here – this is an enormous area dedicated to motor traffic (look carefully on Streetview and you’ll see that the area doesn’t only consist of the roundabout in the image above. Quite possibly this is the largest single defined open space properly inside Edinburgh which is dedicated mainly to motor vehicles – and what we currently have here seems to be rooted in the designs from when Edinburgh seriously considered building major inner city ring road systems. So the time is ripe for change… BUT each and every design (there have been several now) seems to be based on one solid, never to be questioned, absolute, definite, inviolable, untouchable, unbreakable principle… a principle which applies almost everywhere in the UK… which is that we must not lower the capacity of the roads for motor vehicles. In fact, more than this, the designs here seem to be targeted at increasing the capacity for motor vehicles. So Edinburgh is about to build a new gyratory system here (although after a great deal of fighting what is currently proposed might be better than initially planned, it is still a gyratory). But what happened to prioritising cycling and walking? Prioritising cycling and walking means a design which makes it faster / easier / safer / more efficient to cycle and walk here (it’s a key junction) THAN IT IS TO DRIVE. That means a lower capacity for vehicle movement than what’s here just now. If we were to use traffic modelling here then success would look like a bigger queue of traffic for the current volume (although we’d actually assume that some traffic would in fact evaporate, and that queues may not really be longer). If we’d modelled these changes (maybe they did) it would have shown a reduced ability for these roads to carry motor vehicles. AND THAT’S THE IDEA. This change prioritises walking and cycling. That’s what “prioritising walking and cycling” looks like. When you prioritise one thing it has to be over something else. We can’t prioritise walking and cycling and also prioritise motor vehicle movement. Success here is a lower capacity to move motor vehicles. But what about the speeding ‘cyclists’? OK – so now back to the speeding ‘cyclists’ and the tweet I mentioned at the start of this blog post. So at the same time in Edinburgh there is discussion taking place about issues caused by the number of people cycling on the towpath of Edinburgh’s Union Canal. I spoke to an older woman recently who told me how her friends, who had once considered the canal an important resource, had now stopped walking there. In her words the problem was simple – they were genuinely afraid of injury by “The Cyclists”. From her perspective ‘The Cyclists’ are the problem… and her thoughts about them could have come from any cycling fallacies bingo card or Daily Mail hate piece. 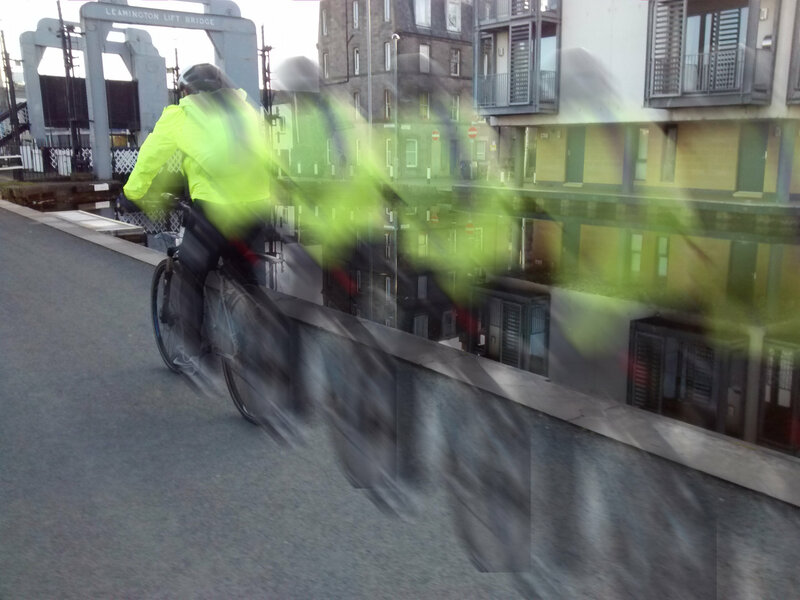 How to explain to her… people cycle on Edinburgh’s canal towpath because this is where they feel safe – this is where they feel that cycling is efficient – this is an effective way to get to work, to the shops, to school, or out for a day trip. And the alternatives, while generally survivable with practice, aren’t very nice or aren’t very efficient. She had taken up a position opposed to cycling altogether… but here was someone I’d like on my side, campaigning for the same changes I’d like to see. She wants what I want – green and pleasant space for people within our cities, accessible by young and old. So what we have here is a classic divide and rule situation. The city – like most – isn’t brave enough to really do what’s needed… which is to accommodate the increasing numbers of people cycling by taking away some space from that dedicated primarily to motor vehicles. So it tries to support an increase in cycling, as do other cities, by mixing those on foot and those cycling. Should we expect those cycling in a mixed cycling/walking space to behave considerately? Well yes of course we should. Do some of the people cycling in whatever mixed cycling/walking space we’re looking at this week behave inconsiderately? Yes some people do do this. Will signs help? Or some rules of some kind? Or a campaign? No – at least not much. Yes… but you have to think much bigger. Well the way forward is for everyone to get as far away as possible from this being about cycling versus walking. The truth is that this is about cycling and walking needing to reclaim space from motor vehicles. Fundamentally, when we look at the big picture and not the local annoyances, this is the wrong question to be asking. The technique of divide and conquer is something I suspected a few years ago as well. Cyclists and pedestrians* are natural allies with a common rival. The auto and oil industries know this and tell the editors of the news media (that they happen to own and/or have influence on) to frame things that way. I see the solution is education about how things work. When someone who walks is bothered by someone cycling by them they need to be educated about how things really should be and asked to work together to request better infrastructure design. *I use these terms only because that’s what the corporate media uses but of course we should always refer to these things as activities. Not types of people. Yes, you’ll note that I tend not to use the word ‘cyclist’ at all – and rarely ‘pedestrian’ although I find this less problematic (it’s seen generally just to mean someone walking whereas ‘cyclist’ carries stereotypes with it). I like to think less about education and more about connecting people – on the basis that connections are the best way to educate. I can tell people lots and lots about what a ‘cyclist’ is, but nothing quite beats realising that a friend/neighbour/your mum/your son is one of the people who cycles…. and even better hearing from them about their point of view. In South Australia they legislated to enable cyclists to ride on footpaths. I feel for the older, less able & people with prams-kids-dog combinations or the earphone set. I don’t want to mix it with walkers if im walking or riding. Problem not solved but some added safety for cyclists. Perfect move really. Something that people who cycle will probably support… but which won’t make a huge difference I imagine (although I may be missing more detailed knowledge about Australia and am happy to learn more). But something almost guaranteed to lead to an increase in opposition to cycling. All for no investment, and achieved without upsetting anyone who drives. Plus it counts as ‘doing something’. I should say that I’m not necessarily saying that anything particular is a good or bad idea – I’m simply asking that people think as if there’s a conspiracy against cycling. Be suspicious. Remember the law of unintended consequences. Would be happy if someone can tell me more about this change in Australia. Road/public spaces need to be optimised for the movement of people and goods. Not necessarily their pre-chosen transport method. 4 cyclists take the same space and are far more efficient than a lone driver in a car. Goods need not necessarily be transported long distance by lorry but “the last few miles” often inevitably needs to be. Of course everyone already knows this, and agrees. The problem is that many people can’t see how this could possibly work in their neighbourhood – country – region. And they can’t imagine themselves riding a bike – it seems alien, against their chosen way of life. And if we’re incautious in our approach we help them back themselves into a corner and begin to defend it. And we make it seem all or nothing. We give them something to defend. We make ‘cycling’ seem like all those other ‘good’ things they’ve heard people tell them they should do… exercise, veganism, disarmament, giving money to charity, taking a homeless person into their home, etc etc etc. So oddly, while I agree with you, I think that the best way to move people towards our point of view isn’t to re-state the obvious facts at them. And we desperately need to avoid – the point of this article – anything that sets up the idea of there being a different group of people – ‘cyclists’. Who wants to become a ‘cyclist’. I had a colleague who started cycling not so long ago, but spent lots of time making sure that she was clear with people that she wasn’t ‘a cyclist’. You’ll see I avoid the word altogether when describing people who cycle – just as I avoid ‘drivers’.